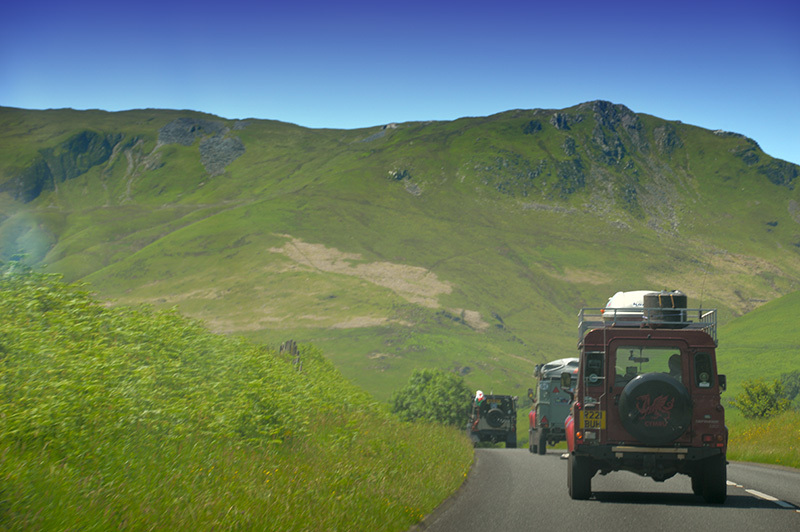 After a year of anticipation, the day of our Unplanned Angesey Tour dawned bright and sunny. The challenge of getting as many members of the club to drive from South to North Wales had been set at a previous club meeting, and despite a Planned tour being offered - where members could stay in Hotels, or cause horror to other motorists by taking caravans - all members had decided to rough it out on the Unplanned (AKA we might be sleeping in a layby) Tour. Members were enjoying a beautiful Friday, and with the warm tropical breezes set to continue into the following week, spirits were high as all arrived for 1600 hours at the meeting point of Asda in Coryton, Cardiff. Despite this the scene greeting the later arrivals was not a positive one! Upon arriving, Paul had raised the bonnet of his Discovery 2 for members to admire, only to discover a massively torn hose! Not being the type to leave anybody behind, members were quickly fetching tool-boxes, scrabbling under the Disco, and being dispatched to acquire a new hose! 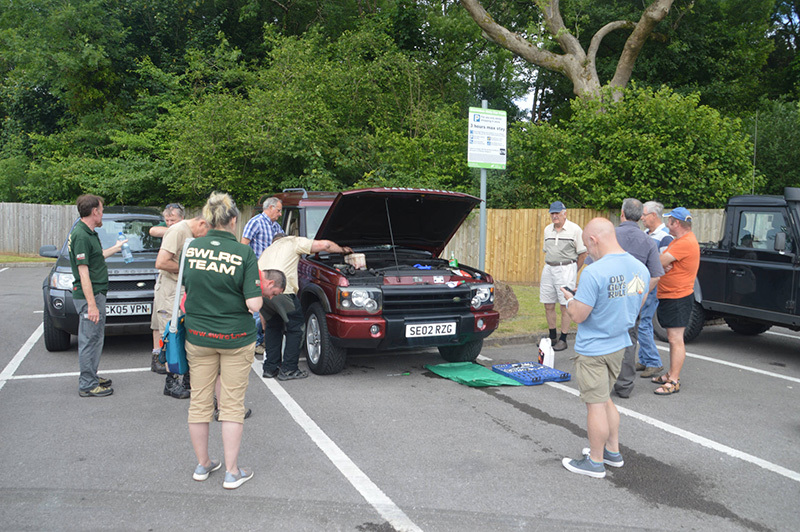 In no less a fashion than would be expected of South Wales Land Rover Club the crisis was quickly averted, the Discovery was repaired, and the warming coolant running through the newly replaced hose gave all hope that the fix was good! It did, however, leave some members (Wayne and Gareth in particular) a little on the damp and oily side. A few hours later than planned, but undaunted, the convoy set off from Asda onto a slowly moving A470, but once the larger valley towns were passed we found ourselves making better progress to Brecon, where the opportunity was taken to have a breather, and check on the earlier stricken Disco (which had become a little steamy on the way, and required some of Tom's expert plumming services). 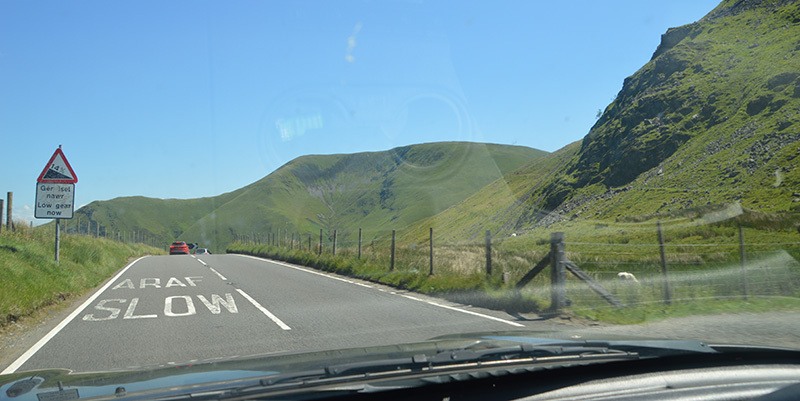 All was now running splendidly, but given the delays that we had suffered a vote was quickly taken to investigate the possibility of camping for the night in Builth, rather than the previously proposed Bala area. And so it was that shortly after seven o'clock we arrived in Builth at our hastily arranged, but ever so lovely, campsite for the night. We were perhaps a little closer to our starting point than we had hoped, but as we all sat down to enjoy Pauline's homemade soup (the real reason why we got Paul and Pauline's Disco back on the road) and a few beers, that was all forgotten, and the sun slowly set on the familiar SWLRC drinking group! We awoke bright and early the next morning to find another glorious day, only overshadowed by the complaints from some that they had endured the worst night's sleep they had ever had, and swearing that they would never leave their caravans behind again. Those of us made of sterner stuff wondered what all the fuss was about - it's all character building! Setting off quarter of an hour sooner than planned we quickly left behind the market day traffic of Builth, and headed north once more. 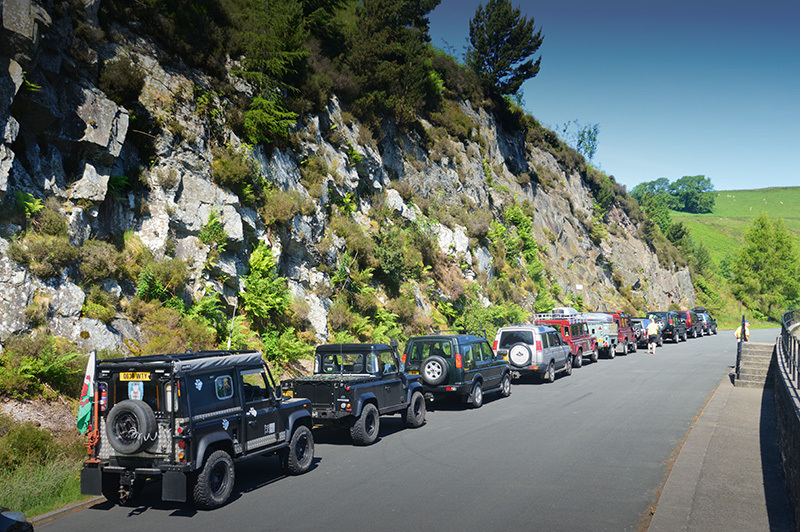 Yesterday's troublesome Disco was running sweetly, but we were soon to learn that as a club our convoy driving did leave a little to be desired as we realised we had lost two of our members! 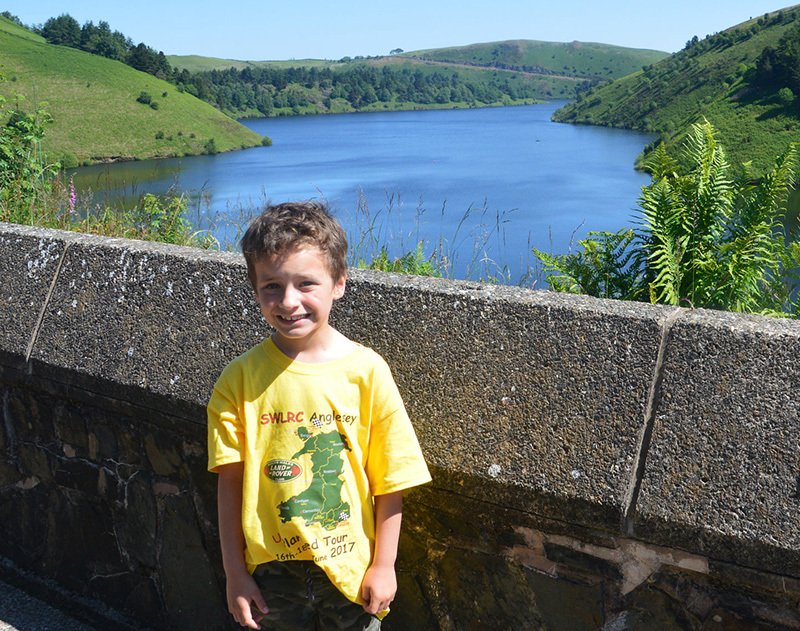 Fortunately this turned out to be a happy accident as we were near Llyn Clywedog reservoir, and so popped in to wait for the rest of our party. Regrouped we set off again, and on this occasion lasted until nearly Bala before we had become divided again. Dinnertime was well overdue, so rather than camping overnight in Bala, we at least dined there, with some taking advantage of the area's cafes and chip shops, while others broke out the cookers and prepared a tailgate dinner. 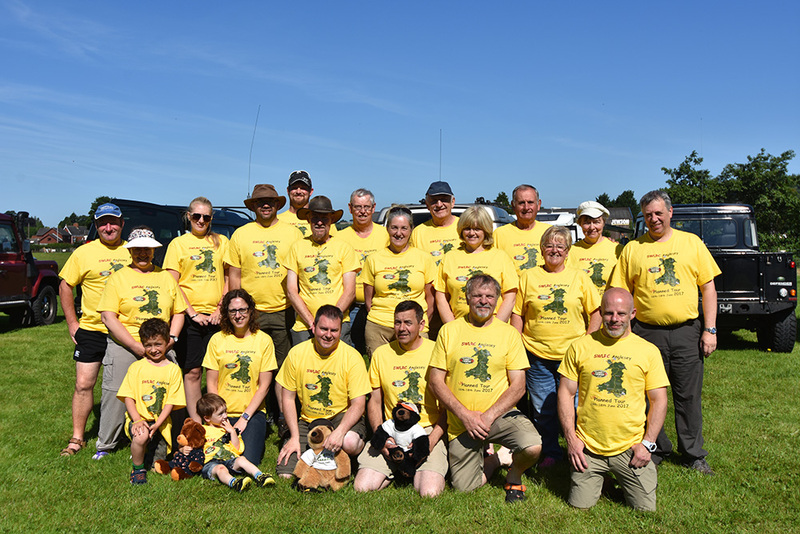 Throughout the day we fielded questions from the public about what we were doing, as our yellow event t-shirts drew quite a lot of attention to us (with 22 of us all dressed the same). They were printed by Dave and Wendy, and are modelled here by Rhys, their designer. Leaving Bala, we may have become separated once or twice more (we will practice our convoy driving before the next big trip) before we reached the Britannia Bridge, and crossed over onto the hallowed Isle of Anglesey and made one final stop at Llanfair­pwllgwyngyll­gogery­chwyrn­drobwll­llan­tysilio­gogo­goch, purely to say that we'd been there (or at least for those that could). We then continued the final ten or so miles to our campsite. 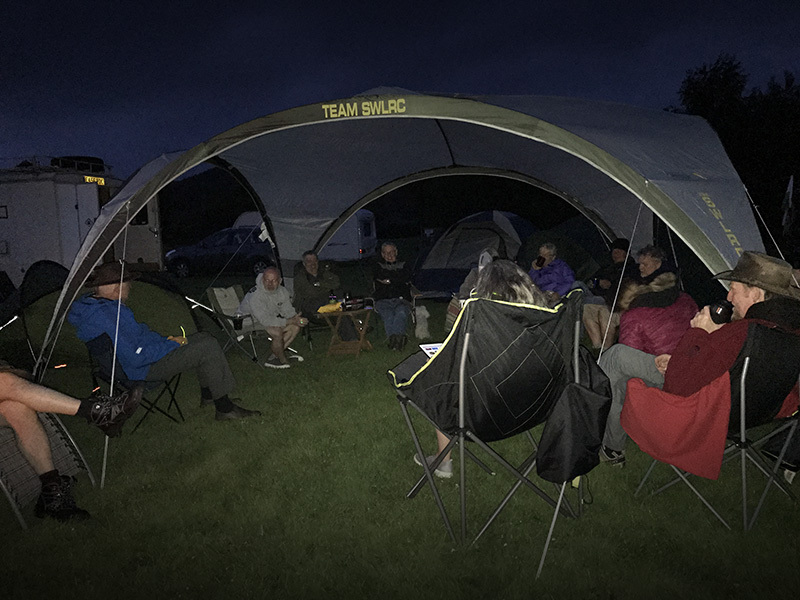 In doing so we passed Red Wharf Bay (birthplace of the concept of the original Land Rover), but carried on - stopping there was scheduled for Sunday morning, and the Saturday evening barbeque was on the minds of most members! (It had now passed six o'clock in the evening). Driving down the most fantastically picturesque approach road to our campsite, a frenzy of tent erecting activity was soon in progress, before finally sitting down to some fantastic hot-dogs and burgers. Both Pauline and Rhys had prepared an evening quiz, and for the more couragous members, Andy had bought with him a bag of recently discovered outdated beer. Given that we were at least still within the same decade as the best before date many a bottle was drunk, and at least as far as we currently know there were no fatalities. Waking on the Sunday morning all were sad that our trip was nearly over, but there was still one last event scheduled before going home! Setting off once again we drove the short distance to Red Wharf Bay, and once we had figured out how to get on the beech, took some final photographs. It was then time to make our weary, but very happy, way home! Thanks go to all of the club members that came along and made it the memorable weekend that it was. Thanks also to those that stopped to help other members so that all could finish the tour. And lastly to Wayne and Amanda for organising the tour - it was billed as unplanned, but we suspect a lot of effort went in to make it the excellent event that it was! Here's to next year's trip! All suggestions welcome!